Cathie Pilkington is a London-based sculptor and a figurative artist, renowned for crafting increasingly ambivalent forms. Her sculptural practice combines the interrelated and antagonistic worlds of fine art and craft. She carefully creates pieces from a vast array of materials, adopting ready-made elements, which are freely assembled, as well as incorporating modelling, carving, painting and other finishes to her works. Her sculptures often take on doll-like forms which approach the immediacy of ordinary figurative playthings, and thereby challenge the art-world’s customary and mediated relationship between the viewer and the artwork. 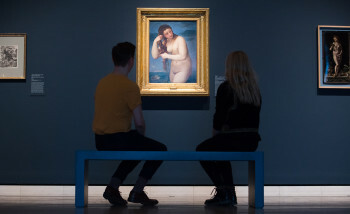 Two of Pilkington’s painted bronzes, Reclining Doll and Twinkle, were selected for the RA’s Summer Exhibition 2014. Her Reclining Doll sculpture was awarded the Sunny Dupree Family Award for Female Artist at the Summer Exhibition this year. Pilkington studied BA Silversmithing at Edinburgh College of Art (1985–91) and was awarded the first John Watson Prize for Art upon graduating in 1991, with a show at the Gallery of Modern Art, Edinburgh. 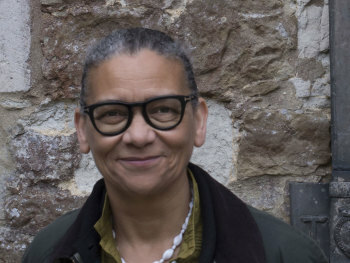 She went on to study Sculpture at the Royal College of Art (1995–97) following which she was awarded the Cheltenham Fine Art Fellowship in 1998. Pilkington has previously showed with Bruton Gallery, Bath (1992) and was in the 1st RWA Open Sculpture Exhibition (1993). She is currently represented by Marlborough Fine Art, where she had solo shows in 2007, 2010 and 2014. She also recently had an exhibition The Value of the Paw at the V&A Museum of Childhood in 2012. Her work is held in the collections of the Deste Foundation, Athens, Manchester City Art Gallery and the David Roberts Collection. Cathie Pilkington RA, Potter Pig. Cathie Pilkington RA, Reclining Doll. Cathie Pilkington RA, Tar baby. This print is part of a suite of four prints, along with Unicorn, Bright Birds, and Origami Goat. Striking and powerful are Pilkington’s darkened background and exaggerated shadow. Pilkington graduated in silversmithing in 1991, the same year she was awarded the first John Watson Prize for Art. Her multiple award-winning work is exhibited internationally.